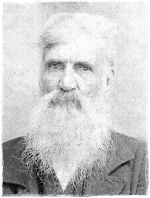 Isham Wallace, the son of Everet and Caty/Catherine Wallace, married Nancy Furr (1806-1881) and is considered one of the mostly widely held common ancestors in upper Moore County. Nancy was the daughter of Charles Furr and Nancy Sowell. Isham, a lifelong farmer, lived on over 1100 acres of land in the Buffalo Creek/Meadow Branch area southeast of Robbins (just east of the intersection of Hwy 24/27 and the Mt. Carmel Road). Isham and Nancy as well as a large number of their descendants are buried, not far from their home, at Flint Hill Baptist Church. A comprehensive listing of every Wallace reference found in Moore County records to date including a full name index.